Northern Michigan is famed for being a great setting for weddings. But beyond its familiar township halls and many beautiful resort ballrooms, there are a number of ceremony and reception sites of all sizes and styles that not everyone knows about. We went to work digging up a list of alternatives sites you might want to consider for your special day. Ready to engage? The Barn, originally built in the late 1800s, has been lovingly restored by the Garvey family. The 40-by-60-foot barn can accommodate up to 150 people, plus there’s a 36-by-40-foot cedar deck, providing room for additional 80–90 people; it can be tented, as can much of the surrounding grounds. Views? It’s a pastoral setting nestled in a small valley. Amenities? Landscaped outdoor ceremony area with arbor, wine barrels, rustic bar setup, large ceiling fans, dance-floor quality flooring in barn, column lighting, assistance with planning, scheduling, and vendor selection. Cost: $5,000 for barn rental. Owners Denny and Sandy Freeman renewed their vows at their farm as part of their 50th-wedding anniversary celebration. A year later, they hosted their granddaughter’s wedding reception, followed by their grandson’s wedding. Tested and true, they transformed their farm into a wedding venue in 2016. Guests can stay in the 4,000-square-foot farmhouse (sleeps 24), and the groom and his groomsmen will no doubt have a blast getting ready in the Clubhouse (includes a basketball court, of course). Amenities include a private bridal suite, flat screen TVs, wireless sound system, walk-in cooler, complimentary wedding planner, weekend availability from Friday to Sunday morning, tables, chairs, and spacious, lighted parking, Wireless Internet, covered outdoor area. While the Homestead offers an array of resort facilities, it’s really hard to beat the top of the ski hill. OK, make that impossible; that breathtaking view overlooking the sparkling waters of Lake Michigan, with the Manitou Islands in the background, can’t be duplicated. And riding to the site in a chairlift? Oh yeah. Amenities include wedding event coordinators onsite, chairs, power for lights, DJ or musicians, on-site catering, cleanup by resort staff, and exclusive use of the site for 2½ hours. Cost: $1,500 in May, $2,500 June–September, $2,000 in October. The winery, brewery, and meadery is also home of Sleeping Bear Farms honeys and related items. The on-site barn is the hub of the wedding festivities. It includes a stage area for DJ or band, dance floor space, and bar area. There’s also an outdoor ceremony site and use of the property for photography. Other amenities include ample parking, use of venue the day beforethe event for set-up and rehearsal, and use of venue the day after event for cleanup. Needed are tents, tables, and chairs; portable restroom facilities; catering; any decorations; and music needs, whether live musicor DJ. Manistee’s great showplace is an outstanding venue in which to see a theatrical or musical performance, but there’s more than the theater. The Rotary Grand Ballroom provides historical ambience, Victorian elegance, and simplicity; Hardy Hall is a smaller, more intimate venue. The Ramsdell offers a catering kitchen with warmers, coolers, and a freezer; comfortable tables and chairs; Wi-Fi and elevator accessibility. Capacity: Rotary Grand Ballroom, 300. Hardy Hall, 100. Cost: Starts at $700 for Hardy Hall; up to $3,150 for theatre ceremony, Hardy Hall, and ballroom reception. 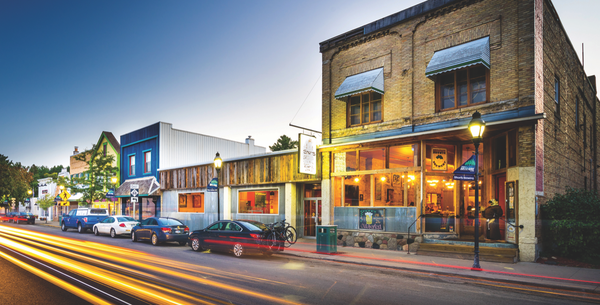 The historic City Opera House offers history and modern amenities, all in the heart of downtown Traverse City. Rentals include the use of the lobby and/or auditorium, state-of-the-art lighting and sound, green room, tables and chairs (décor and linens are the responsibility of the rental party), and a COH event manager onsite. History comes alive with the surroundings, including a turn-of-the-century curtain and backdrop, and Victorian red-velvet chairs. Sure, town halls are a popular choice, but few offer such ambience and history (after all, it’s right there in the name). Boasting small-town Up North ambience, HERTH offers a large hall with a stage, period lobby, sound system, and your choice of round or rectangular tables. You have your own choice of caterer; nearby Siren Hall restaurant provides on-site beverage service. And whether for the ceremony or relaxation before, during, or after the reception, the beach is right across the street. 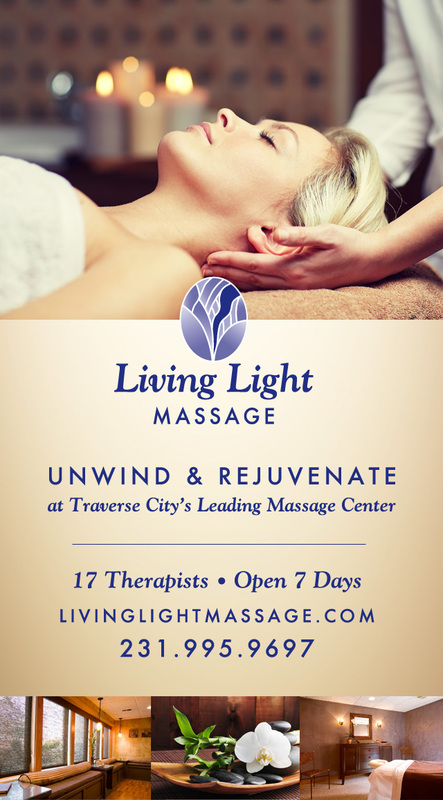 Many people don’t even know it exists, as it’s hidden away on the Grand Traverse County Civic Center grounds. The new and improved natural amphitheater at the Civic Center is — or will be — available for rental, following the summer season of Parallel 45 Theatre. Kristine Erickson, the director of parks and recreation for the county, says that will be sometime in mid-August. The partnership between the county and the theatre group is providing an opportunity to “bring it back to its former glory,” according to Erickson. Capacity and pricing are yet to be determined. Another Grand Traverse County-owned park, this one is being emphasized as an event venue. Set on the shores of serene Twin Lake off Long Lake Road, it boasts a lodge building, dormitory, cabin, and pavilion with a fireplace. Besides the lake views, there are eight trailheads. 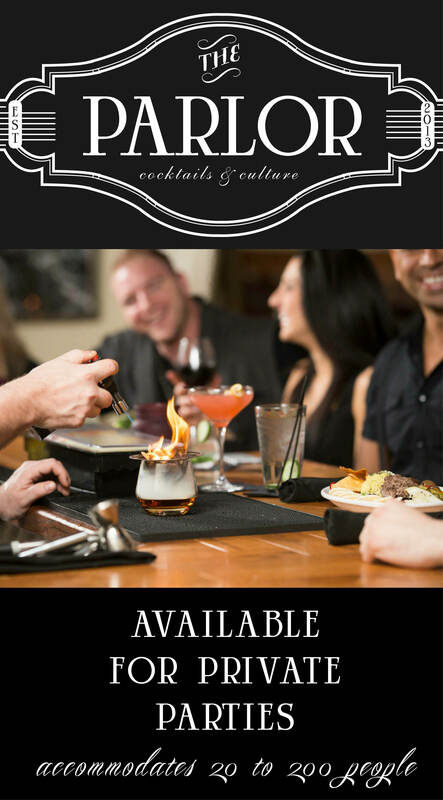 Gilbert Lodge includes a commercial kitchen, fireplace, and outdoor patio. Capacity: Up to 100 seated, or 200 overall, at the lodge. The dorm sleeps 140. Cost: For county residents, $176 for the pavilion, $296 for the lodge off-season, $348 in-season (Friday–Sunday). Non-resident pricing is also available. Not just an art gallery, the Elizabeth Lane Oliver Arts Center is getting into the event-hosting business as well. It offers a unique venue — hey, it’s already decorated! And as the gallery shows change, so too does that décor. Plus it offers views of Betsie Bay and Lake Michigan. It has an area for a bar and other rooms as well. Tables and chairs are provided; cocktail tables are not. Catering options are wide open, and it does have a full kitchen, as well as a staff member on-site to assist or troubleshoot. Parties must end by 11, with the facility closing at midnight. Owned by the village of Elberta, the Life Saving Station is abeautifully restored historic building on Betsie Bay. It opened in the early 2000s as an all-in-one destination wedding and reception venue. It’s available from 8am to 2am. The venue provides tables and chairs. Most choose to use the outdoor deck overlooking the waters for the dance floor. Choose your own caterer. Capacity: 130-plus. Add tents, and capacity goes to 350, though you’ll need to provide more tables and chairs. When Bryan and EmmaCloninger found 78 acres of pure, untouched Michigan beauty, they embarked on the process of building an event center fit to celebrate the most important moments in life. Knowing one day isn't always enough, they decided to add luxury camping (go ahead, call it glamping) accommodations. 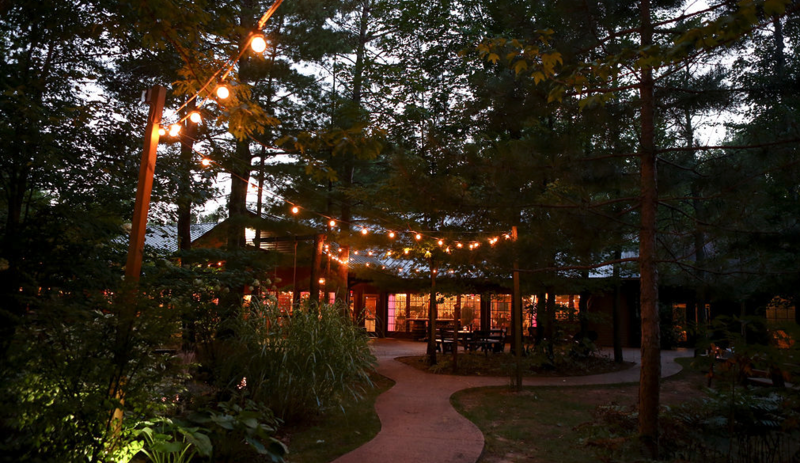 Now Nature Michigan Retreat offers everything from free Wi-Fi access, video projectors, and screens to a massage room, bars, warming kitchen, locker room with toilets, showers and changing areas, an outdoor terrace, and even a mezzanine with VIP lounge and a kid-friendly area. Rocky Top Farms is known for its fruit butters and preserves, but it also features Rocky Top Preserve, a wildflower-filled valley in the midst of the 300-acre cherry orchard. Couples can say “I do” next to the spring-fed pond, among the surrounding birch trees, or in the cherry orchard under the arbor with glimpses of Lake Michigan as a stunning backdrop. In addition to the Rocky Top “Preserve,” Rocky Top Farms is home to two custom-built timber-framed cabins and has two glamping (sigh) sites. And the cherry butter, raspberry preserves and WHAT are easy andtasteful (tasty?) wedding favors for guests. Cost: Starts at $900 for wedding site only, up to $5,000 for glamping, cabins and camping for two nights. Located on ten acres between Traverse City and Interlochen, BlueBridge is a natural outgrowth for Chris and Stephanie McCrumb, who have variously served as wedding officiant, wedding coordinator, floral designer and decorator. The property is home to a number of different on-site venues. The Bridge Chapel and the Bridge Centre offers a covered outdoor patio and a large dance floor. The Blue Chapel and the Blue Centre likewise feature patio and dance floor, though smaller. The Woodside Chapel and the Woodside tent is an outdoor seasonal site. Other settings include the bridges, a wedding swing, a large gazebo, BlueBridge park with a small vineyard, and access to Ellis Lake by way of golf cart. Onsite services include DJs, flower service, rehearsal dinner and brunch spaces, alcohol and bartenders. Capacity: 260 at Bridge, 160 at Blue, and 60 at Woodside. Bay Harbor Resort offers a boatload of sites. Almost literally, as its several private beach and waterside options attest. Sunset Beach, the Observation Platform and the Marina Beach all overlook the glistening waters of Little Traverse Bay. Among the unique settings is the Bay Harbor Equestrian Center. The property offers several options for weddings, receptions and related activities: An upstairs bar and lounge, an indoor venue and several outdoor venues perfect for tents. Cost: Pricing ranges from $350-$6,000 depending on the day of the week, season and venue selection. Cherry Basket Farm is a restored 120-year-old farm just north of the historic village of Omena. The ten-acre farm offers a restored farmhouse, gambrel-roofed two-story timber-framed barn, gardens, handicapped-accessible restrooms, and on-site parking.Rental of Cherry Basket Farm requires catering services by onsite Epicure Catering, LLC. Cherry Basket Farm offers easy access from M-22, separate bride and groom dressing areas, a forested ceremony site, lower barn area with bar, cocktail tables, bar stools and a gift table, farmyard and – wait for it – yard games, crisp white pole tent for dining with removable window sides and dimmable lighting, tables and chairs. Then you go upstairs for dancing and general merriment, with a dance floor, seating for 50, a coffee station, dessert station and ample power for band or DJ. Talk about unique. The Music House is a 100-year-old dairy barn that is home to some of the most amazing and rare antique automated musical instruments in the world. A 12-rank 1917 pipe organ and a huge 1922 hand-carved Belgian dance organ stretch the width of the balcony. Imagine George Gershwin playing at your wedding – and there he is, courtesy of an original player piano. The turn-of-the-century setting furthers the atmosphere of a bygone era. Enjoy the ambience in the Hurry Back Saloon with its long Mahogany bar, Italian crystal chandelier and working orchestrians and nickelodeons. Then your guests can wander through the Acme General Store with its pot-bellied stove, shelves of old-fashioned remedies, tools and foodstuffs. Outside catering available for the real food, while tents and portable restrooms can increase the capacity. The Stormcloud Tasting Room at the Brewery is a new venue, with a new use. As the brewery began to max out its brewing capacity at its original downtown location, it looked across town for a new, bigger location. In so doing it built in a tasting room and beer garden. They are now available for special events such as wedding receptions. Course, it requires additional catering (food trucks are a staple) but there’s plenty of brews on tap: 11 beers and one cider, along with a wine and non-alcoholic beverage menu. Hey, there’s even a charging station for your electric car. Try finding that at your basic ballroom. Inside, the spacious event center welcomes guests. Outside, Fox Hill is nestled in a beautifully landscaped, private hill overlooking the city of Cadillac. Guests can mingle on the manicured lawn and in the courtyard featuring a waterfall. You can even have the wedding ceremonies on the landscaped patio. The stone courtyard features a pergola which makes the perfect backdrop for a wedding ceremony. Guests can enjoy the sunset and then dance under the stars in our courtyard. The facility is complete with lobby, coatroom, bride’s room, bathrooms and space to setup a bar. Catering is provided by the Blue Heron Café. Accommodations? Three hotels are within a quarter mile. The Portage Point Resort hews back to the beginning of the last century. Construction began in 1903, and it is even listed on the National Register of Historic Places. Its historic banquet room features a wonderful view looking three miles east across Portage Lake through its massive picture windows. In the middle of the room is a large hardwood dance floor and stage, and through the French doors is the bar area. But wait, there’s more: You can also have outdoor events and ceremonies on the lawn in front of the beach and Portage Lake. Guests can stay right on property, choosing from cottages and condominiums. This picturesque farm outside Kingsley exudes rustic charm and country romance. The grounds include the farmhouse (built in 1914), where the bridal party will get ready on the big day; the similarly historic barn; the wedding area next door to the barn, a.k.a. the Hitchin’ Post; and a triple-peaked wedding tent where everyone will gather to enjoy the bride and groom’s first meal as newlyweds. Fun amenities? You bet: There’s an Old Time Photos photo booth, complimentary popcorn and candy bars, even outdoor games and a huge fire pit. Onsite staff will assist with planning and coordination, as well as setup and teardown. Many of the region’s vineyards and wineries offer space for weddings and/or receptions. 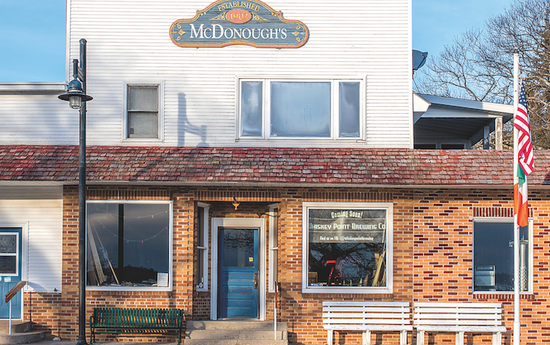 Mackinaw Trail Winery goes further than most. Start with the fact it has a 40 by 80 pavilion with bridal preparation room, restrooms, catering preparation room. You want ambience? There’s a fireplace, a panoramic view of the vineyard, a gazebo located down by the pond (perfect for the wedding ceremony), and a patio. Beer and wine of course, including two complimentary bottles of champagne, as well as free wine tastings during the first year of marriage and a bottle of wine on the couple’s first anniversary. Tents and catering are readily available but not included. Start with a wedding in a gazebo overlooking the Northport Marina. Then process through the quaint town at the northern tip of the Leelanau Peninsula to the old (like 175 years old) mill, passing by the namesake willow tree and a water wheel on a flowing creek that exits to Grand Traverse Bay. Inside, the rustic charm of a double-sided fireplace (one of three fireplaces) complements the ballroom with its exposed beams. The stone surround windows, foyer, all-seasons room, lower level patio and screened porch complete the warm and elegant atmosphere. The casual elegance of Willowbrook Mill offers a storybook setting. 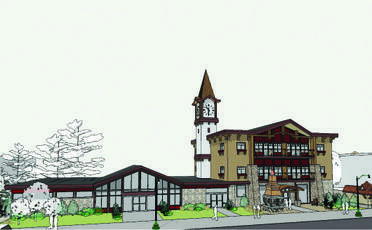 Options abound at Kirkbride Hall, located in the Village at Grand Traverse Commons. Weddings often take place on the historic Front Lawn, home to the largest northern Michigan arboretum. Or you can opt for the intimate and dramatic surroundings of Kirkbride Hall itself. Built between 1883 and 1885, it served as the chapel at the former Northern Michigan Asylum. Today, the restoredand unique round room features windows on all sides bringing in plenty of natural light, complemented by the chandelier suspended from the soaring ceiling. The hint of old-world glamour mixed with contemporary elegance in the unique setting makes Kirkbride Hall a truly unique experience. Amenities include dressing areas for the both bride and groom, dance floor, wedding coordinator, and a prep kitchen, linens, silverware and glassware all provided. Cost: $2,000-4,500 for reception; includes 12 hours of event time with set-up and clean-up. One of the largest commercial lavender farms in Michigan, this unique farm is home to 25 varieties of lavender, as well as honeybees and a historical barn dating from the 1920s.It hosts a variety of related activities, such as showers, rehearsal dinners and brunches, as well as weddings and receptions. Wedding ceremonies take place among the rolling hills of lavender, then the bride and groom and guests can dance the night away under the grand chandelier in the beautifully restored barn. Included are tables, chairs, white linens and napkins for up to 150, as well as set-up/tear-down services.Added touches are romantic lighting and a whisky barrel bar.